Google Page Creator Will Be Closed In June 2009 ! As per the announcement, Google Page Creator will be closed and all the linked web pages will be aleo-3d-flash-slideshow-creator-lets-you-create-3d-slideshow/">migrated to Google Sites. 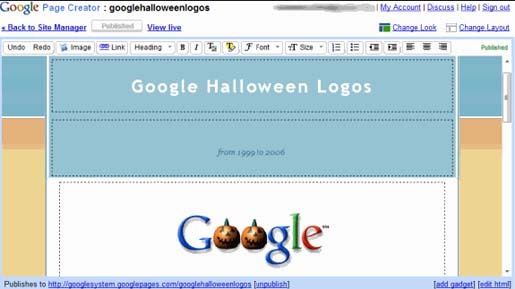 Already you might have noticedhow-to-get-email-alerts-whenever-anyone-edits-google-docs-form/"> Google Page Creator, which has been launched in 2006 as an experimental service. It is a testbed for a rich text editor that is to be added to other sort-tables-in-google-docs-easily/">Google services. Moreover, this page creator is a free tool available for creating web pages right in your browser and you can publish them to the web in view-ms-office-documents-as-html-in-gmail/">one click. translate-your-word-document-in-ms-office-itself/">Want to translate your Word document in MS Office itself ? If you are going to google-now-offers-real-time-translation/">use this feature, you don’t need any software to download and no web designer to hire, “Google has described the service at the launch. For each page creator site, you can have 100MB of file storage, 41 predefined themes, a basic image editor and theoutwit-docs-firefox-addon-lets-you-save-your-precious-time/"> option to insert Google Gadgets. The service has been released two weeks before Google acquired Writely, which later became a part of google-removes-dictionary-link-in-its-search-results/">Google Docs.